Subject to correction, the product was first added on 2019-01-14 16:14:22 and the last date we have for this product is 2019-01-14 16:14:22, where the last unit was sold for R 8160, which may have been a final clearance price. Canon LENS CONVERTER WIDE WD-H58W, 58 mm Copyright © 2019 ComXpert International CC - COPYING IS ONLY ALLOWED FOR THE PURPOSE OF SENDING US ENQUIRIES. E&OE. The Canon WD-H58W Wide Converter Lens is optically matched to go with the XA10 HD camcorder, but it is also compatible with other Canon camcorders and can be attached to any lens with a 58 mm filter thread. The WD-H58W brings a wider angle of view to your images and either 0.7x or 0.8x magnification may be printed on the lens. The WD-H58W is a great investment if you're looking to pack more of your subject into the frame. This is useful if you're shooting groups of people, small rooms, or wide landscapes. The best price and guaranteed service and backup from official computer suppliers in South Africa for the 4892B001AA Canon WD-H58W Wide Converter Lens. Find related 4892B001AA Canon WD-H58W Wide Converter Lens products in our Digital camera lenses Category for even more options. 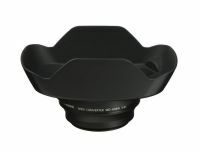 Read reviews and find out about 4892B001AA Canon WD-H58W Wide Converter Lens. Discounts, specials and cheap prices only at ComX Computers.